The Coconuts Sail Team are currently building a state-of-the-art offshore foiling Mini 6.50 that is designed by the top naval architect of our times, Guillaume Verdier. Skipper Jay Thompson chose to work with Verdier because of his experience designing boats that fly. Jay has been building the boat himself in a hanger in Brittany France. After launching the boat he will start a busy training schedule to prepare for the next racing season. Jay will set out to be the 2nd non-French person in the 40 year history of the Mini-Transat to win this race. Jay’s ambitions don’t stop there, he dreams of putting together an IMOCA60 campaign, to participate in the famous Vendee Globe round the world solo race. This boat is a full carbon fibre construction, equipped with a canting keel and the latest foil design. New technologies will be tested, it is a research and development project for Verdier, attracting a lot of attention from the media. Since their inception in 1977 with the first Mini-Transat race (a biennial trans-Atlantic solo race), it was clear that testing on these “Formula 1” boats was and still is the future of all boat design. Foils were allowed for the first time in the Mini-Transat in 2017, making the boats fly above the water, truly a spectacle to watch. Mini’s are a great way to promote, brand and launch companies, the race attracts world wide media exposure and partners are associated with being at the leading edge of design and innovation, making a bold statement to customers. When Messenger was built in '82 racers brought wine and playing cards along with them and foul-weather gear consisted of PVC coated nylon. Times have changed but just like a 1982 Ferrari invokes nostalgia, Messenger speaks of an era of offshore racing that many can identify with. 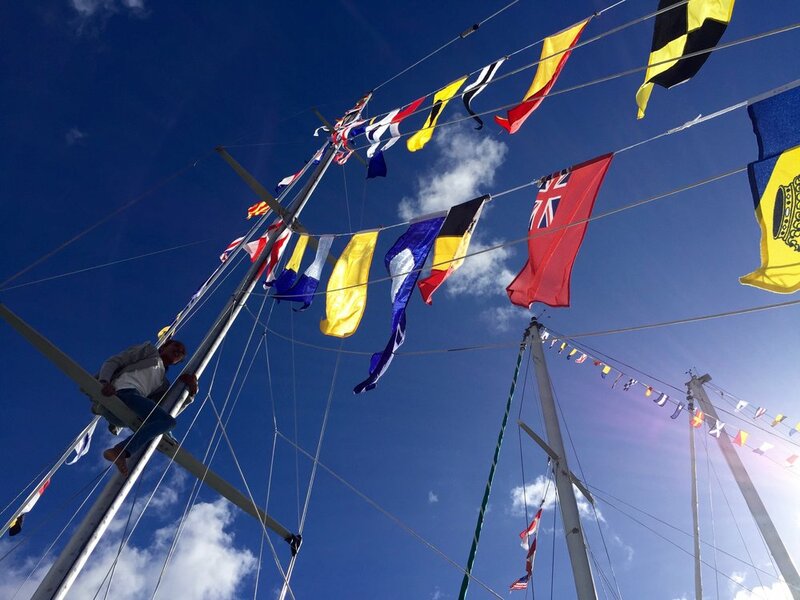 We use Messenger for all types of public relations, trade shows, regattas, networking opportunities, team building and hospitality as a spectators boat at race starts. The Coconuts Sail Team is a family of six whose sailing roots grew out of their love for the sea and traveling. For a decade they lived a nomadic life aboard their eco-sailboat (engineless), now they tackle the world of professional sailboat racing. In 2010 we acquired Messenger a prototype race boat which was in need of a lot of love. After some very hard work with little money we set sail on a voyage that would take us some 20,000 nautical miles throughout the Caribbean, Atlantic, Arctic, and North sea. Our journey was filled with unforgettable memories and hardships, but that's what a proper adventure is all about. Now our passions have progressed into a business in which we have combined our strengths of sailing and multimedia production skills to create a company that provides unique activations for our partners within professional sailing events and the multimedia buzz encircling these events. The name 'The Coconuts' began during our travels, many years ago while sailing in the Caribean we had a coconut tree growing out of a coconut which was sitting on our tiller. We referred to the coconut as our compass which always pointed us in the "right direction". That in combination with our family being mixed race and clearly representing the brown exterior and the white interior, the name stuck and since then we have been called The Coconuts. The Coconuts Sail Team has brought together their passions and professions to form a company whose powerful team is truly a unique platform to target specific markets. They achieve great results by using the sport of sailing and multi-media to reach affluent markets. Born in California in 1985 Jay is a professional sailor and boat builder who has lived onboard sailboats since 2006, sailing throughout the world, Jay has competed against some of the very best sailors in races around the world from racing on Lasers in the acclaimed Fleet413 in Newport, RI, placing 7th in the F16 World Championship in 2014, racing in the Marstrom32 circuit and TP52s to preparing an IMOCA60 for the Vendee Globe in 2016. Jay enjoys most, short handed racing offshore and his experience gives him the ability to learn quickly and adapt to any situation. He has worked in many different countries and speaks English, Spanish and French. "Traveling has taught me to have a open mind so that I never stop learning." Born in Costa Rica in 1976 Natasha is a filmmaker who has had a life long career in multimedia arts. She began taking photographs and making movies at an early age obtaining a Bachelors and Masters degrees in film, television and photography, strengthening her passion for using different mediums for communication. She taught film at NYU and later founded her own production company. She began a life at sea in 2010 with her husband Jay and daughters Sol and Luna, along the way more crew members were added, Caribe who was born onboard in Martinique and Ártico in Iceland. Natasha’s artistic skills covers a wide spectrum, she has naturally become the "onboard media-person" and has been in charge of all the design, commercial production, social-media, press outreach and public relations for the Coconuts Sail Team. Comprised by Sol (2005) born in USA, Luna (2006) born in Costa Rica, Caribe (2012) born in Martinique and Ártico (2015) born in Iceland, the mini crew is a group of international kids who have grown up living aboard a sailboat, traveling the world and learning many languages. They are a group of siblings who love to inspire and teach other kids about sailboat racing, environmental awareness and how to become young entrepreneurs and make their own money. They are in charge of “For Kids, by Kids” a platform on this website where they share their stories and experiences with other kids. During our travels we obtained a significant amount of press and many media outlets have been showing a strong interest in our current Mini project, we have formed strong relationships with journalist working on the largest sailing publications in the world. We participate in sailboat racing and other related events, working together with our partners to create a mutually beneficial integrated marketing plan with unique activations that create memorable experiences for customers. For a year, from August 2015 to August 2016, ISNIC, the .is TLD Registry, sponsored our voyage from Iceland to France with stops in the Faroe Islands, Orkney Islands, Norway, Germany, The Netherlands, and Belgium. .is readable you can incorporate your domain name in a slogan using the word "is"